Sometimes, words just fail. As an introvert, I frequently struggle to put thoughts and feelings into words, at least in the moment. They eventually come, though sometimes days after the experience has passed! After moving to the Netherlands and trying to learn Dutch, I discovered a new term. I was alingual. I couldn’t speak Dutch, and my English seemed to have gone on vacation. So I was often without words. Recently, however, I had an extremely wonderful experience that left me speechless. On March 28, Ward and I became grandparents for the second time in seven months. We are at that place of saying, “Keep them coming, this is fun!”, though I am not sure our children are in agreement! Meeting these two little guys has been one of the highlights of my year, very possibly even of my life. Seeing them, and finally holding them – those moments are utterly indescribable. To cuddle a new baby, look into his eyes and see the goodness of God and the promise of a life yet to come… Words just simply cannot convey. How do you explain that moment? Is it joy, wonder, gratitude, humility, excitement, love, anticipation? Many are far better at putting into words that feeling of…of…what? Even as I finish that last sentence, the words won’t come, and those that do seem inadequate. This experience of lacking words to express our heart’s deepest places is not exclusive to times of jubilation. There are moments of pain so overwhelming that there are no words to tell even God what we are going through. Sometimes God gives us tears, or even groans. The Scripture tells us at these times that the Holy Spirit intercedes for us to the Father in utterances too deep for words. These moments eventually land us in a place of silence. It may be peaceful or restless, but there is nothing left to say. We become profoundly aware of our inadequateness and our ‘otherness’ from God and also sense His goodness and sovereignty. We experience his holiness. And in some inexplicable way, where words fail, we are led to worship. As I reflected on this language lapse, I realized that there was a time when words were not enough for God either. The separation from and brokenness of those He loved was too great. He had sent many with messages: leaders, priests, prophets, judges, kings. But in the end, the words were not enough. We were lost, beyond repair, dead in our sin. There were no words left for God to say. He needed another way to express His love. 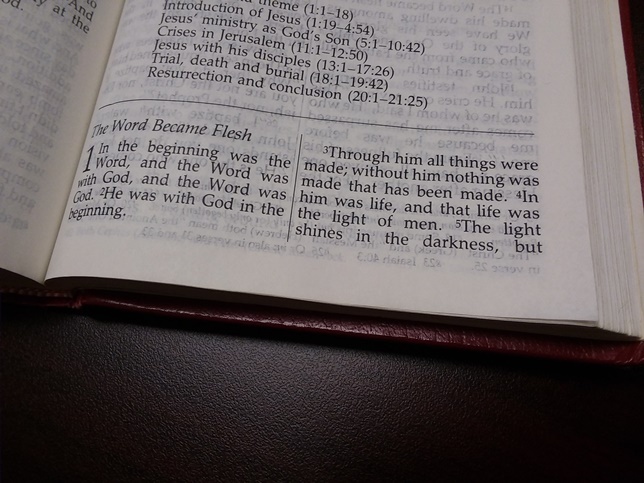 So He sent the living Word, our Savior. It is no coincidence that Jesus is called the Word in the Gospel of John. Jesus is God’s ultimate message to us of a Love so glorious that He willingly became the payment for a sin so hideous. When spoken language alone failed, “the final Word was Jesus” (to quote Michael Card). God spoke infinite and eternal wisdom through Jesus’ birth, life, death, and resurrection. And in this Word, God created a way through our brokenness and separation back to Himself. As we continue this season of Lent, our words probably ought to intentionally pause for just a while as we sit in the silence to hear and worship His Word that never fails.